I am not a kitchen gadget person. My kitchen is very small. My house lacks storage in general. So, when I get a new kitchen tool, it needs to be necessary... or small. At the end of last year, I hosted a house party and was given a Soda Stream to demonstrate. I had two friends decide they HAD to have one, so I guess the party was a success! I wasn't sure how much I'd actually use a homemade soda machine. It seemed ridiculous. Impractical, even. I spent time trying to figure out how much money I'd save making soda at home vs buying it on sale. And yet, I couldn't help falling in love with it! One of my favorite things to do is just carbonate the water and add citrus oils. It's far less expensive to do this than buy citrus flavored carbonated water. Like most things, you have to look for deals. We trade in our used canisters. A friend said he trades his in at a store where he can use discount coupons! I haven't tried it yet, but hey...if it saves money, right? My biggest savings comes in the syrups. I use my discount points from Sears to buy syrups. Every time I have "surprise points," I end up with free syrup. It was an even better deal when I found the syrups on sale for half price AND I used my points! Today, I got a really fantastic deal on strawberries at the farmer's market. Instead of jam, I decided to try my hand at making a strawberry syrup to use in the Soda Stream. It was crazy simple and I ended up beating several levels of Candy Crush while it cooked. In a large saucepan, bring the sliced strawberries and water to a boil. Boil for 20 minutes. Skim off any foam. 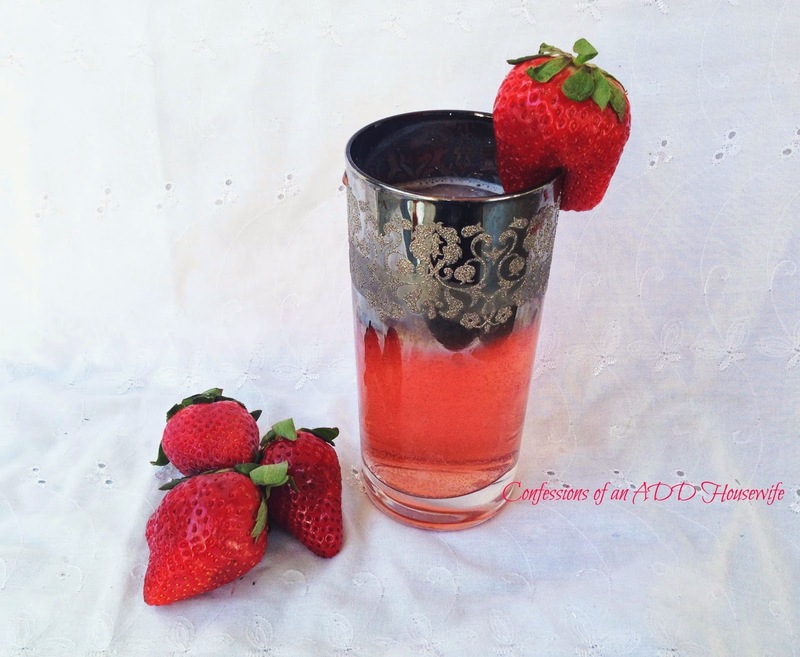 Using a mesh strainer, pour the strawberries and juice from the large saucepan into a smaller one. Do NOT push down on the berries. Just let it drain. To the smaller saucepan with the juice, add 2 C sugar. Simmer about 5 minutes until thickened, stirring occasionally. Cool. Pour in to glass jar with lid. Store in refrigerator. To make soda, carbonate 1 liter of water. Add 1/2 C syrup. Found you through the Best of the Weekend link party. This is a really great idea especially as the weather is slowly getting better over here. Pinning!!! Hi Micki! 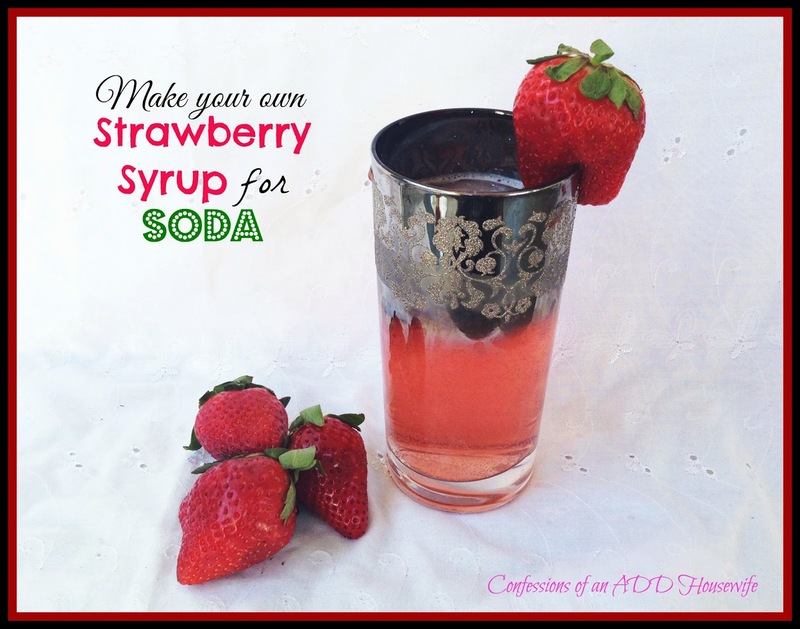 I love strawberry and this is so perfect for spring and summer - I can't wait to try it! Thank you so much for sharing at Best of the Weekend - pinned! Hope you're having a fantastic weekend and have a happy week! Awesome my daughter would love this!